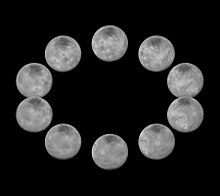 Not to be confused with the minor planet 2060 Chiron. 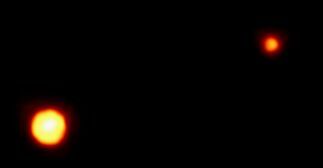 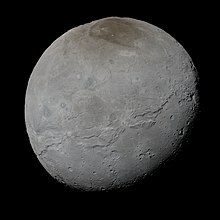 Charon's volume and mass allow calculation of its density, 7003170200000000000♠1.702±0.017 g/cm3, from which it can be determined that Charon is slightly less dense than Pluto and suggesting a composition of 55% rock to 45% ice (± 5%), whereas Pluto is about 70% rock. 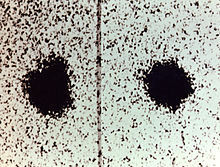 The difference is considerably lower than that of most suspected collisional satellites. 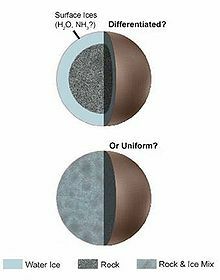 Before New Horizons' flyby, there were two conflicting theories about Charon's internal structure: some scientists thought Charon to be a differentiated body like Pluto, with a rocky core and an icy mantle, whereas others thought it would be uniform throughout. 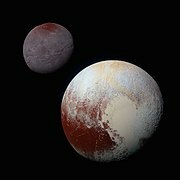 Evidence in support of the former position was found in 2007, when observations by the Gemini Observatory of patches of ammonia hydrates and water crystals on the surface of Charon suggested the presence of active cryogeysers. 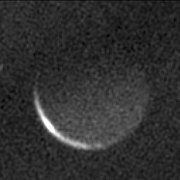 The fact that the ice was still in crystalline form suggested it had been deposited recently, because solar radiation would have degraded it to an amorphous state after roughly thirty thousand years. 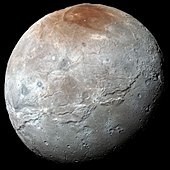 Charon has a series of extensive grabens or canyons, such as Serenity Chasma, which extend as an equatorial belt for at least 7006100000000000000♠1000 km. 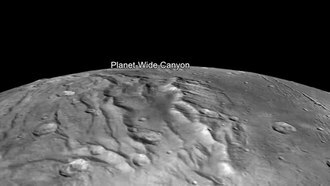 Argo Chasma potentially reaches as deep as 7003900000000000000♠9 km, with steep cliffs that may rival Verona Rupes on Miranda for the title of tallest cliff in the solar system. 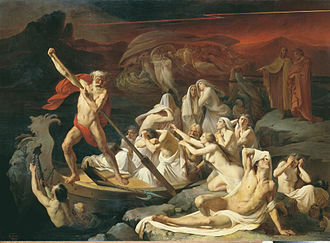 Wikimedia Commons has media related to Charon (moon). 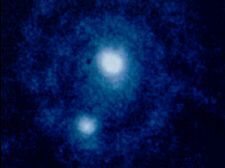 This page was last edited on 11 April 2019, at 03:42 (UTC).